From Scott’s Run Nature Preserve. 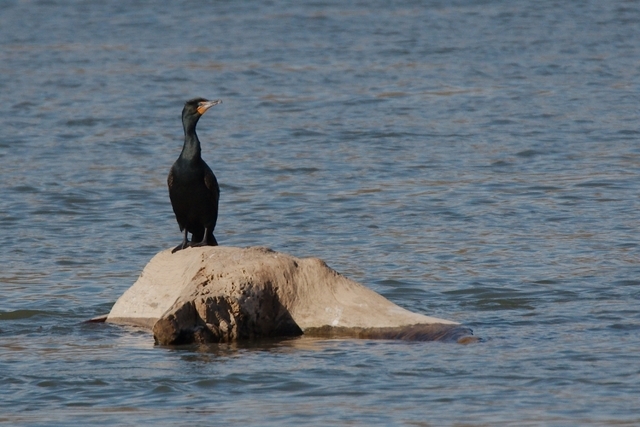 On Conn Island, from the Maryland side of Great Falls. 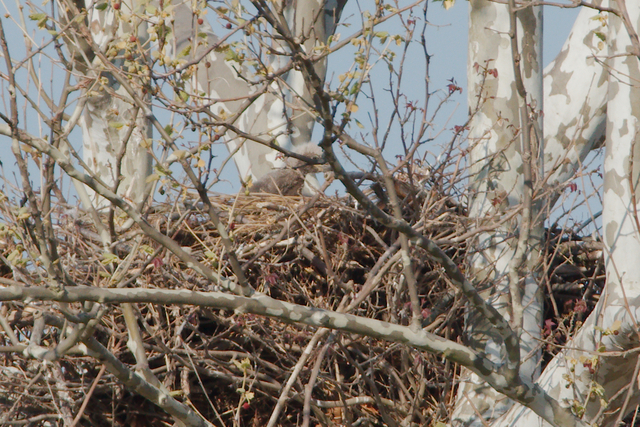 The gray blobs sticking out of the nest are babies. 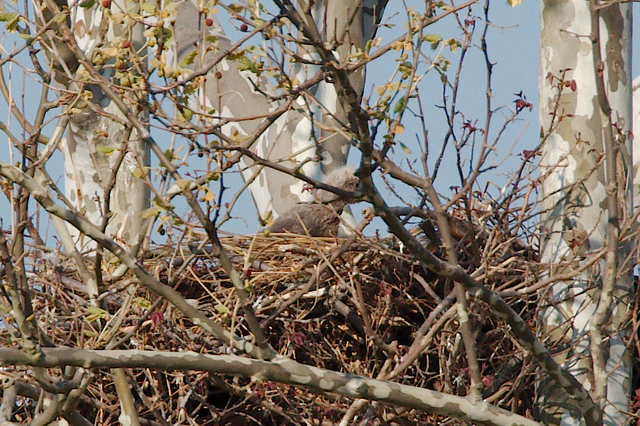 April is nesting time for many species. 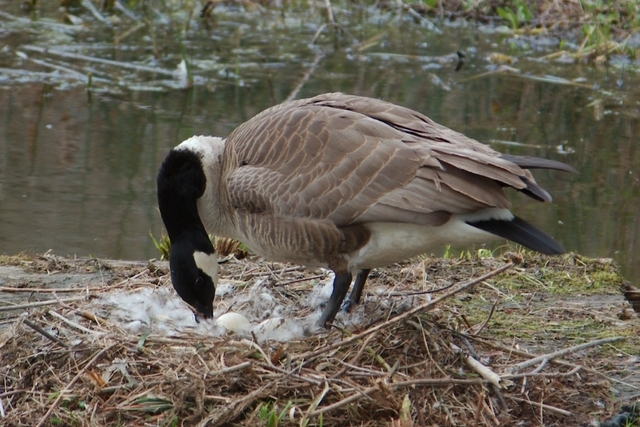 Most animals are extremely wary of others getting near their eggs or young, but I met a Canadian snow goose the other week at Meadowlark Botanical Gardens that let me walk right up to her nest. 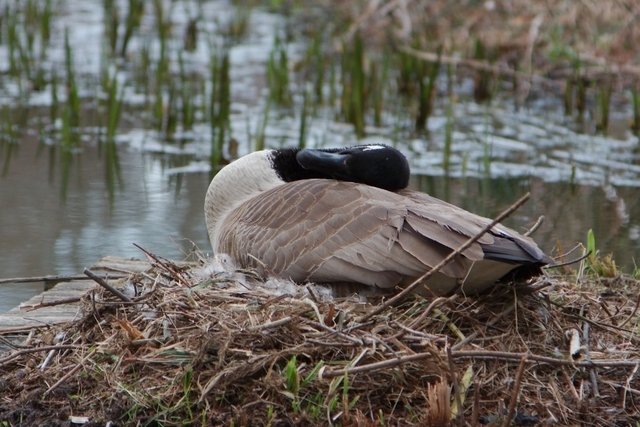 After carefully arranging and checking the eggs, she settled down and preened, although I decided she was doing goose yoga. Who else has been tending to their eggs?! 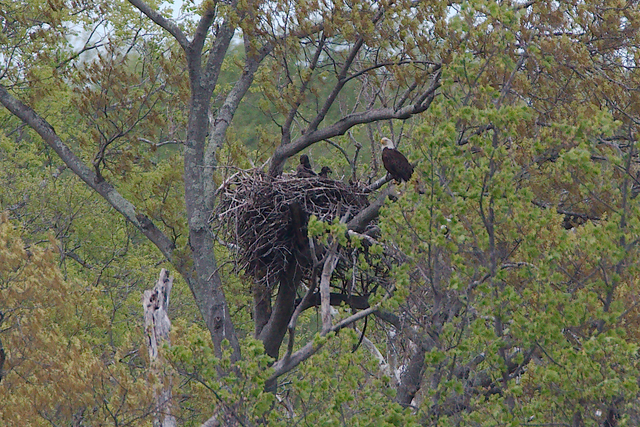 The bald eagles, of course! 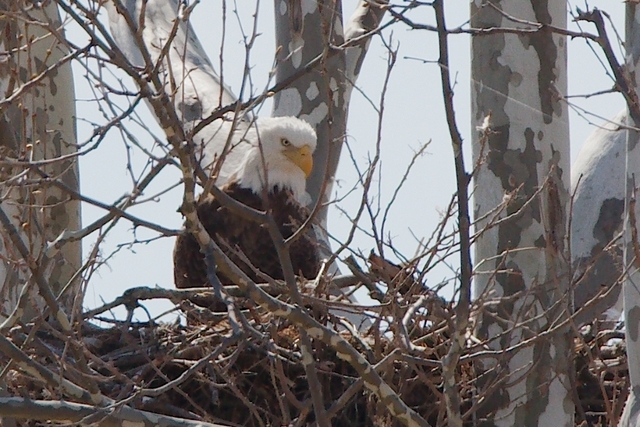 This picture is from a couple of weeks ago; I’ve heard the eaglets have now hatched. I can’t wait until they start flying! 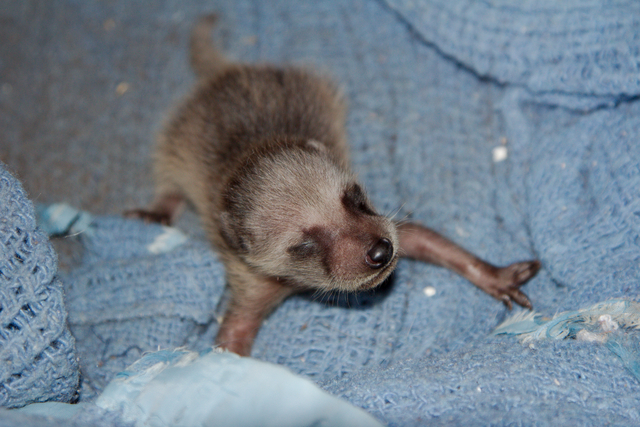 And yes, although they don’t come in eggs, it’s baby raccoon time as well! Taken two weeks ago, this is one of Emmy’s babies. It was 5 days old in this photo. Emmy is a wild raccoon that was rehabbed by Dogue Hollow their first year, so she’s ten years old. 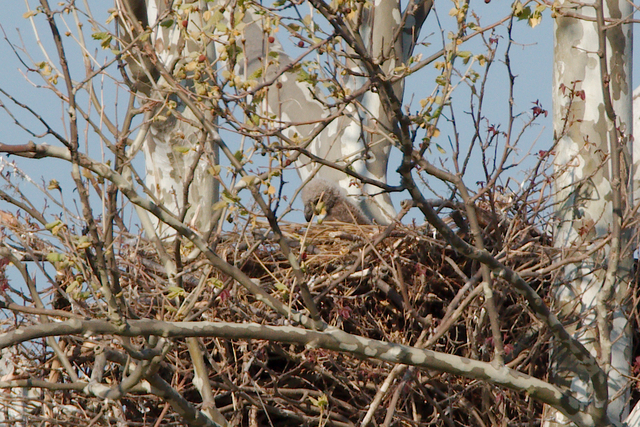 She’s also a great mother and has raised orphan babies for us in the past. In fact, when a neighboring mother raccoon left her den for too long last week, Emmy couldn’t stand the babies’ crying and trotted over and “rescued” one before the other mother returned! Speaking of Dogue Hollow, a very kind reader alerted me a while ago of Amazon’s new “AmazonSmile” program. All you do is pick your favorite charity, then start shopping at smile.amazon.com instead of www.amazon.com and Amazon will donate 0.5% of the purchase price of many of their items (nothing I have bought in the last few months has not been included) to that charity. I’m not going to spam you and beg for money (although we desperately need some! ), but this is really a free and effortless way to raise a little money for your favorite charity, and if your favorite charity happens to be Dogue Hollow, so much the better! 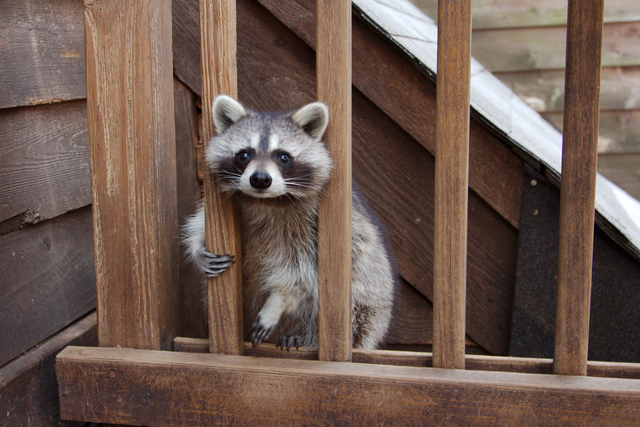 Make a raccoon happy today! 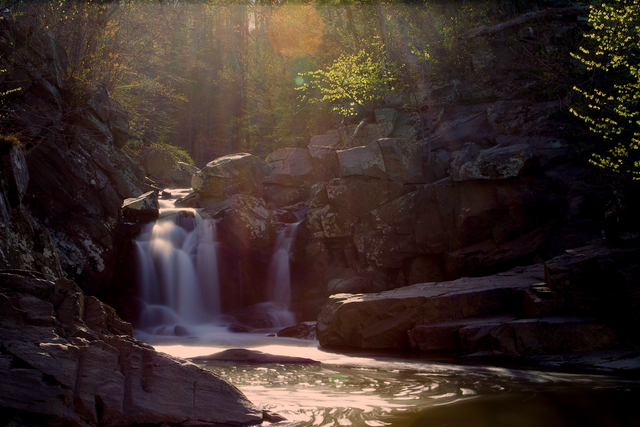 Wonton Soup and Kimchi to chase the sickness away…and I love nature! Bring the water to a boil and add the bouillon, vinegar, oil, and soy sauce if you are using it. If you are using miso, scoop some broth out before it comes to a boil and whisk the miso into it, then set it aside. Add the frozen wontons and cook until they are warmed through. If using, stir the miso into the soup. It’s also a great idea to add a lot of grated ginger to the broth, especially if you are serving the sick. Top with sliced scallions if you have them available. And I like to add sriracha to my bowl. Serve with copious amounts of kimchi. Rather than making kimchi, I bought some. Mark was nothing but grateful to me during his illness, except for telling me I didn’t buy ENOUGH kimchi the first time. But that’s okay, kimchi is really good for fighting germs, so I just went and bought him more. Yes, I realize this is a ridiculous “recipe” to give you after weeks of radio silence, but believe me, that’s what’s been going on culinary-wise in my house for the last two weeks. Aside from taking care of Mark when necessary, I have been EMBRACING SPRING. I probably say this every April, but OH MY GOD I have NEVER been so glad to see spring. Last winter was cold, snowy, and STUPID. There is probably some truth to the fact that I’m more glad this year, even over other snowy years, because I feel like I just appreciate life in general more and more all the time. Not that I ever didn’t appreciate life, because I’ve led a happy life, but I don’t know; I seem to actually take the time to be thankful for things more than I did when I was younger. And to that end I’ve spent nearly every day of spring so far in a park, hiking and taking pictures. It feels weird to be sitting inside right now at 5:53, in fact, because I’m usually outside gallivanting around at this time. (I gave myself until 6 to write a post before going out so I’d better hurry up…). I have felt neglectful of the blog, though. Not that I had any recipes to post, but I still felt as if I wasn’t doing something important to me. SO, I’m going to try to post much more often, BUT until the farmers market starts (next weekend, FINALLY!) and provides me cooking inspiration and/or until the weather turns less AWESOME than its been and I’m not pulled outside like a magnet every night after work until after dark, I’m probably just going to have pictures for you, and they probably won’t be food related. But so as not to be super annoying, I’ll just do one a day. Maybe two…we’ll see how good my self control is. 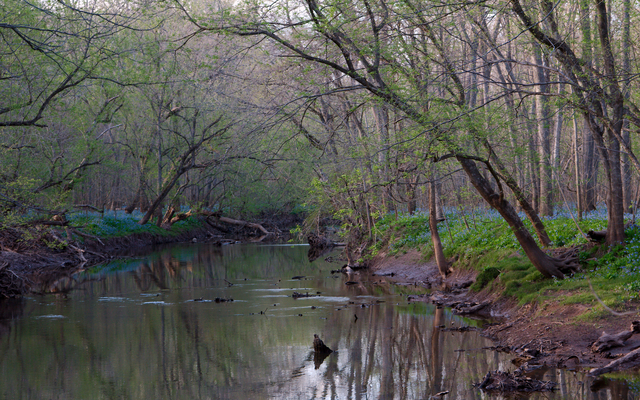 So to start off, I present a few pictures of something that gives folks in this area super spring fever (other than the DC cherry blossoms): Virginia bluebells. 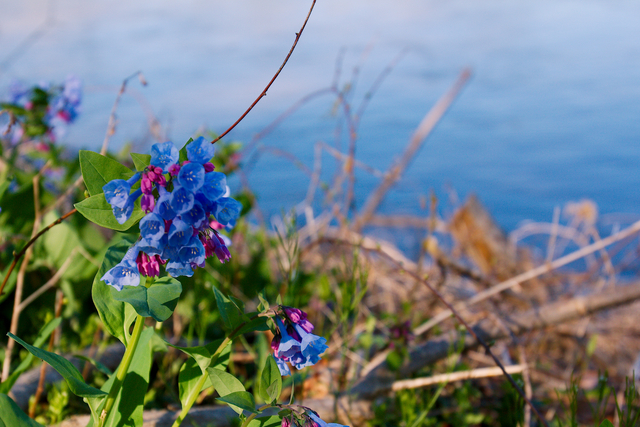 The gorgeous usually-blue plant lives in marshy floodplains and is one of the first things to bloom every spring. 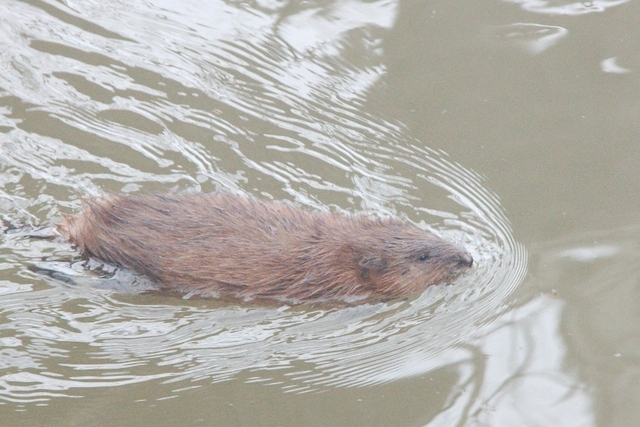 They peak for a week or so and then they are gone, but while they are around, if you find a place where they are abundant, it’s like being in a wonderland. It’s one of the most beautiful things I’ve seen. I’ve been bluebell stalking in several places this year, some of them new to me. I’m letting myself post a few more than one picture today just because I’ve been gone a while (and also I can’t help myself when it comes to bluebells). The pictures tonight are from two parks. 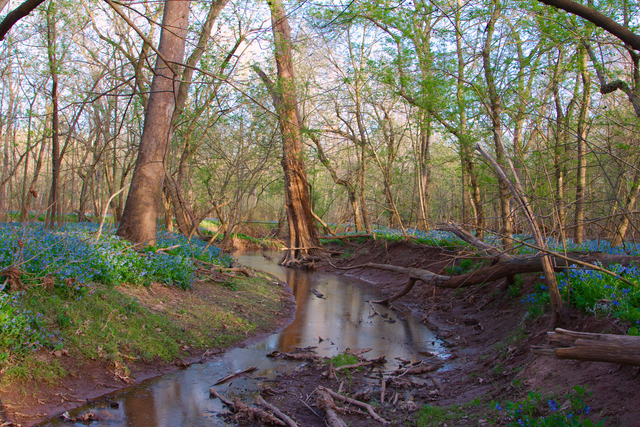 The first ones are from Riverbend Park, which I just discovered a few weeks ago (when looking for prominent bluebell locations) and have since fallen in love with. Riverbend has everything: the Potomac River, the Potomac Heritage Trail, woodland trails, a meadow trail, BLUEBELLS, it’s free, AND you can hike into Great Falls National Park, which is lovely, but kinda pricey and the parking lot is often full on really nice days so it’s cool to “sneak” in for free. 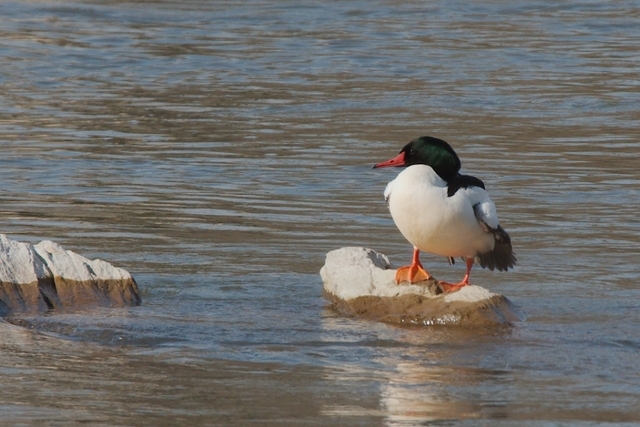 It’s only about 1.5 miles from Riverbend Visitor Center to Great Falls Visitor Center! I’ve been to Riverbend several times in the last few weeks and love it. And it’s especially great when the bluebells are blooming! 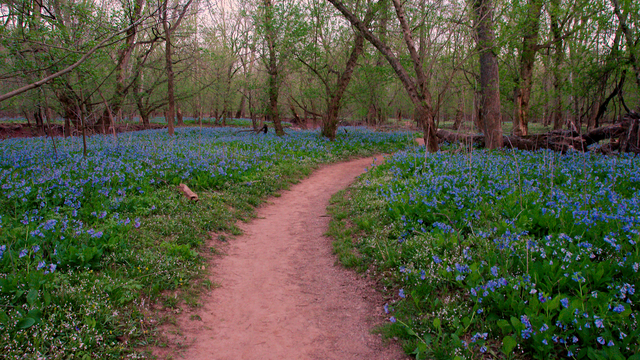 My favorite bluebell spot in previous years has always been Bull Run Regional Park, and even though Bull Run was a near fiasco when I went for my first visit of the year a couple of weeks ago (the trail was so muddy and slick I nearly fell about a hundred times, AND they are doing some water main work that disrupts the bluebell trail in two places and is ugly and constructiony), I have to say that when I returned for the bluebells, it won my heart again. 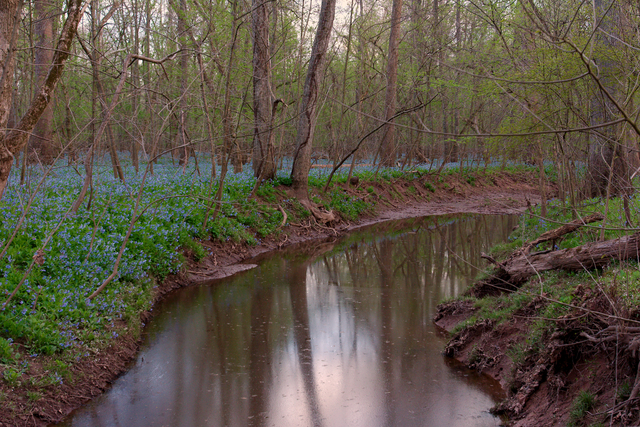 Bull Run is THE best place to see bluebells. If you are local and go nowhere else to see them, go there. 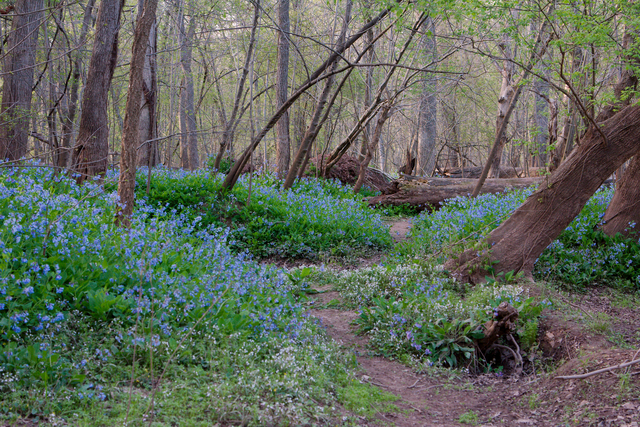 I might prefer other parks for other reasons, but for bluebells, Bull Run is #1. There are just ACRES of them. 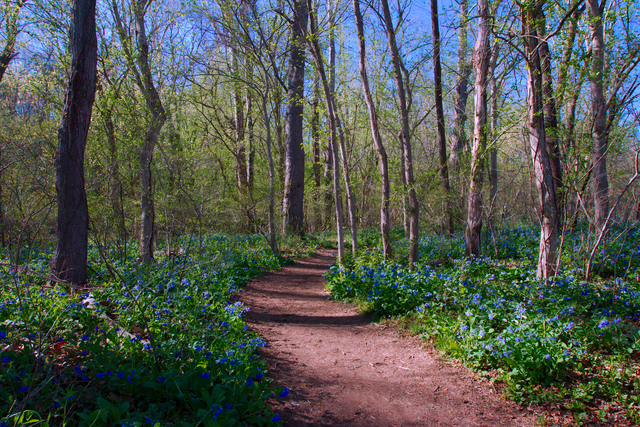 My tip: on the bluebell trail (from the entrance across from the water park), once you get to the water, head left off the trail. There is a very narrow path through the dense bluebells for a while (though it eventually stops), and if you keep going, you’ll find yourself completely surrounded by bluebells for as far as the eye can see. And you won’t run into everyone and their brother walking their dog and taking cellphone pictures while you are off the official path. 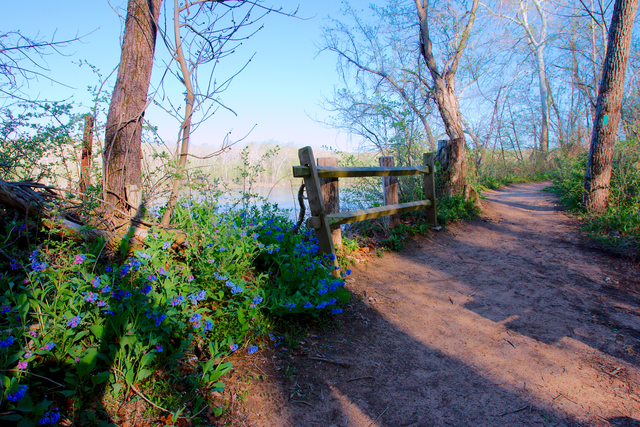 After enjoying the blue solitude, head back to the trail and finish the loop – it’s all lovely (minus that construction), but there’s nothing like being totally immersed in a carpet of blue. Okay, I NEED TO GO OUTSIDE now. 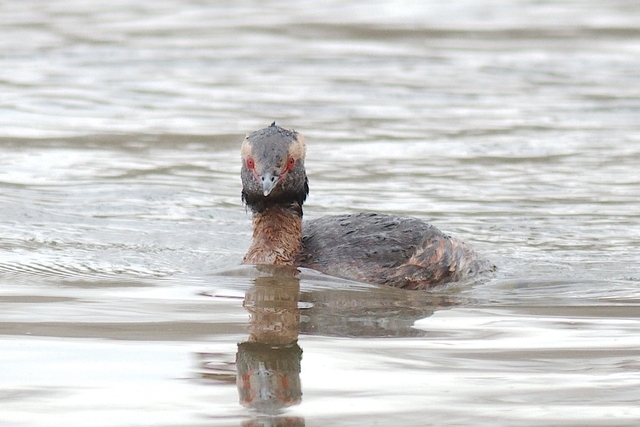 I will be back, hopefully tomorrow, with another picture or two…although I can’t promise it won’t have bluebells in it.